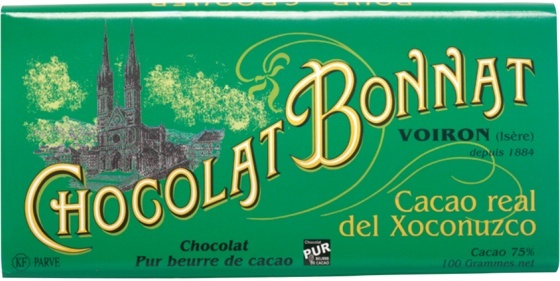 Chocolate bar from the Grands Crus Bonnat collection. This 75% chocolate made from an exceptional cocoa promises you an interesting taste trip! Allergens May contain traces of nuts, gluten, milk and soy. Storage in a cool, dry place between 16 and 18 ° C.
The motto of Bonnat is: «What makes the palace feel good does not hurt the soul. » Since 1884, the members of Bonnat’s family have developed a knowledge where the good and the well done are really important. Family of creators and craftsman, artisanal chocolate has become a shared commitment. Stéphane Bonnat, who is now the Maître-chocolatier, is continuing to produce Maison Bonnat's historic products and to create exceptional new chocolates! Their products are regularly awarded medals in international competitions. Real Del Xoconuzco cocoa is the first cocoa known to have been harvested by man. In Mexico, it was given to Emperors of pre-Columbian civilisations, to bring them strength and courage. It was also the first cocoa to cross the ocean, much to the delight of European palates. Yet, the cocoa trees of Xoconuzco are difficult to grow and were gradually abandoned, despite their fantastic flavours. 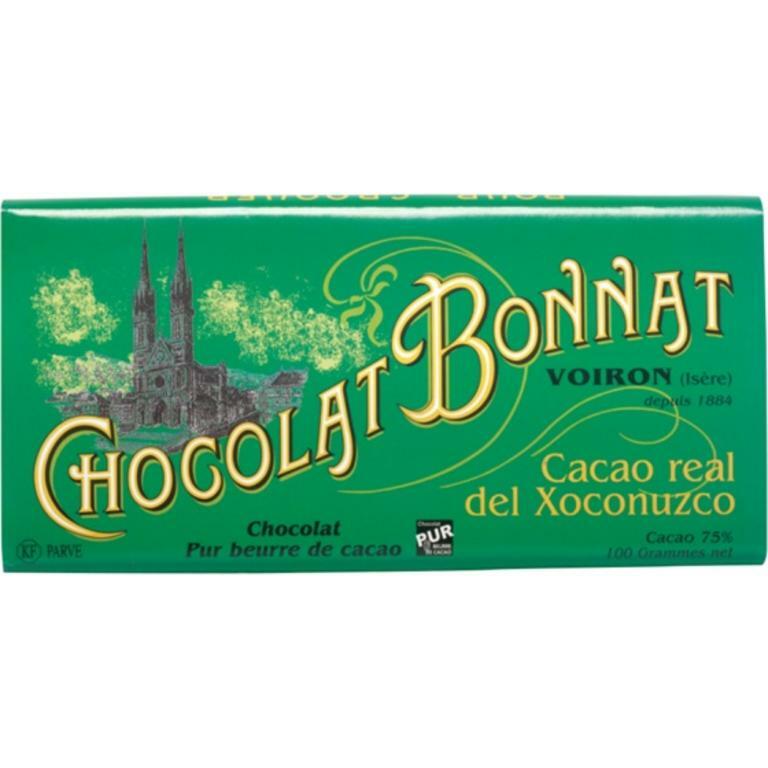 For the first time since 1850, Bonnat offer you the chance to experience the entrancing fragrance and exceptional flavours of this cocoa. Ingredients: Cocoa, cocoa butter, sugar. Dark chocolate bar made from beans from one of the best terroirs of Ecuador. Harvest 2017. A unique chocolate! A 73% dark chocolate bar made from organic cocoa beans from Nicaragua.